The Florida Education and Training Placement Information Program (FETPIP), is administered by the Florida Department of Education. 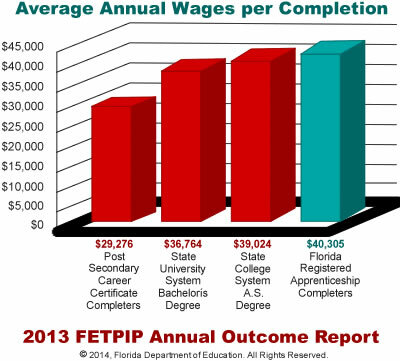 The data collected concerns the educational histories, placement and employment, military enlistments, and other measures of sucess of former participants in Floridas educational and workforce development programs. This chart includes data from Florida Universities (SUS), Community Colleges (CC), Adult Apprenticeship and High School Graduate Programs for Fall 2004. Data on this chart represents a portion of the program groups FETPIP tracks. More information is available from the Florida Department of Education.